These Pinterest-worthy seaside towns not only pack a punch in terms of their beauty, but also make for fun and relaxing holiday destinations that will have you counting down to take-off. Charming Valencia in Southern Spain is a holiday paradise. The town is perfectly proportioned for leisurely exploring, you can’t help but stumble across the old city walls, the cathedral and the town plaza, all spectacular in their medieval beauty. Spend an afternoon browsing the central market for the finest in Spanish hams, cheeses and wines before sampling some of the delights in one of the open air bars. The beach is just a short ride away, so grab your towel and a gripping holiday read and spend the day luxuriating in that Mediterranean sun. Lytham Saint Annes is a postcard-perfect seaside town in Lancashire. Complete with bandstand and pier, you can imagine your grandparents coming here for a romantic weekend back in their heyday, and it’s lost none of its charm. Accommodation options aren’t the cheapest, however there are many more affordable options in nearby Southport for the budget-conscious. Grab your wind breaker and a bucket and spade and enjoy a day on Saint Anne’s beach, making sure to have an ice cream cone. Spend the afternoon lightening your pockets in the arcade on the pier, before grabbing fish and chips to eat on the beach. If you fancy a spot of sightseeing, Lytham Windmill and Lytham Hall are both fascinating monuments to the area’s heritage. Lytham Hall also shows movies on a big screen on the lawn during the summer, for a fun al fresco evening. A holiday to Tavira in Portugal will provide you with all the charm of the Algarve with some Caribbean-worthy beaches. Stretches of pristine white sand with the turquoise sea beyond cannot fail to entice you. The town itself is all pretty harbour-side shops and restaurants, ripe for pottering. Stopping for an afternoon drink is a must, select a shady spot by the river for ultimate people-watching. After nightfall, the town glowing in the street lamps, you’ll spend many an evening luxuriating over romantic meals or working your way through the cocktail menu. Gorgeous Sorrento is perched on the magnificent cliffs of the South West of Italy, and is perfect for a seaside getaway. Whether exploring the town, hiking in the nearby hills or eating your way through the delectable seafood on offer, you are sure to be entertained. As this is a popular destination, there are many beautiful rental properties available which you can use as your base for exploring this stunning area. The Piazza Tasso is the perfect place to start your meander through the town. Take in the impressive duomo before ambling down whichever side street next takes your fancy for a few hours. 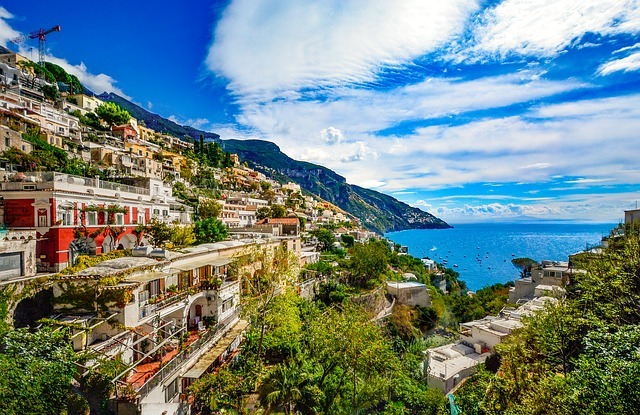 The area is famed for breathtaking hikes, none more impressive than the ‘Path of the Gods,’ a challenging walk which will reward you with once in a lifetime views over the Amalfi coast. For unassuming loveliness, Rovinj in Croatia is a great choice. The town is built on a small headland, giving the streets a quaint, compact feel. The town boasts several pretty churches and an enjoyable afternoon can be spent pottering between them and the warren of shops and cafes. When it’s time to hit the sand, Mulini beach boasts trendy bars and incredible sunsets, or why not hop on a boat over to Katarina island for some cove-hopping on this secluded stretch of shore. As seaside towns go, these destinations are not only pleasing on the eye but offer everything you could possibly want in a holiday. From sumptuous food to photogenic sightseeing, you’ll be sure to come back with plenty of stories to tell.